Just as it is difficult, if not impossible, for The Simpsons not to repeat itself several millennia into its deathless run (not many people know this, but The Simpsons actually began production during the Paleolithic Age) it’s equally difficult for me not to repeat myself 91 episodes into my ongoing exploration of the greatest television show of all time. As I have noted many times before, Springfield is perpetually on the verge of an apocalyptic city- (and possibly even civilization-)ending riot. Springfield represents an incredibly fragile, delicate ecosystem. All it takes is a slight breeze to transform the ordinary madness of everyday life into a full-on crisis. Allowing the Pandora’s Box of legalized gambling to be opened in Springfield is more like a hurricane of ominous portent. As the title conveys, “$pringfield (Or, How I Learned Stop Worrying And Love Legalized Gambling)” is less about the Simpsons than the city they live in and by extension our country and our society. 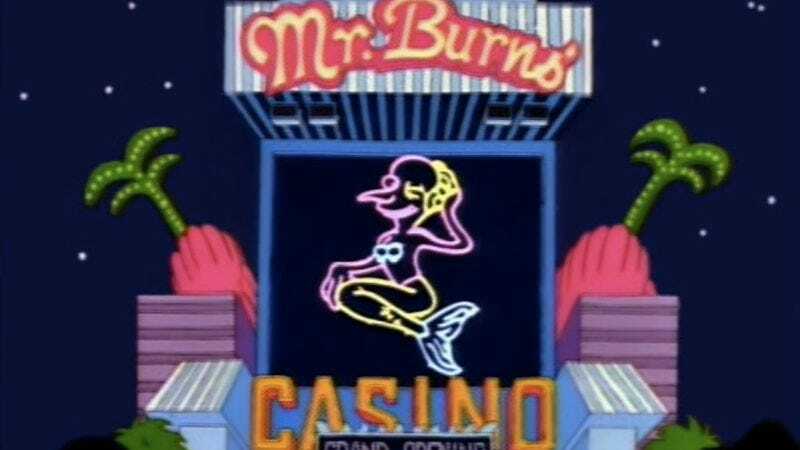 It’s a brilliant exploration of the impact legalized gambling has on all segments of society, from powerful tyrants like Mr. Burns and Mayor Quimby—who use it to increase their already massive power—to ordinary citizens like Marge, who gets addicted to its tawdry glamour. It’s a premise deep and rich enough to sustain an entire season. “$pringfield” is accordingly overflowing with inspired subplots that reflect the wide-ranging effect gambling has on Springfield. Burns decides to build a casino and lurches into unmistakably Howard Hughes-style madness as he hides from a world he is convinced is overrun with malevolent germs and builds his dream aircraft the Spruce Moose (the show’s take on Hughes’ fabled Spruce Goose). The Spruce Moose is the opposite of the Spruce Goose. The Spruce Goose was the largest operating plane of its time; the Spruce Moose, in sharp contrast, is really just a tiny model of a plane Burns, in his narcissistic delirium, is convinced will actually fly. Homer, meanwhile, realizes his latest life-long dream of being a dealer at a casino while Marge lurches into gambling addiction. Bart, meanwhile, discovers an entrepreneurial spirit when he’s kicked out of a casino and decides to start his own miniature children’s casino, with entertainers ranging from Milhouse The Magician to Robert Goulet, who favors the pre-pubescent set with a jazzy, spirited rendition of the kiddie favorite about Batman smelling and Robin laying an egg. Not to be left out, Lisa struggles to come up with an acceptable costume for her school’s geography pageant. All of these subplots are nestled elegantly inside the episode’s overarching main plot: The ruin of Springfield. But before Springfield can fall from grace, we’re reminded of the town’s glory days via an opening newsreel boasting of the town’s many accomplishments, from its aqua-car factory to its dominance of the galoshes industry to its home as the birthplace of the world-famous Professor Rubber Mouth. The newsreel is shot through with the ebullient optimism about the future and boundless sense of possibilities that characterized the Eisenhower and Kennedy years, that overriding, culture-wide sense that the future had already arrived and was awesome. This pitch-perfect parody of newsreels doubles as a glimpse into the ostensible heights from which Springfield has fallen though there’s an unmistakable element of desperation lurking behind the corny narrator’s upbeat take on Springfield as a city “on the grow.” We then segue from the glorious past to the abominable present, to city in peril. The city coffers are so depleted that in a town meeting, Quimby proposes using what’s left of the town treasury to move to another town, run for mayor, then send for the entire city of Springfield once he’s firmly established. Principal Skinner proposes a slightly more practical plan: by legalizing gambling, the town could raise money for under-funded schools. The idea of helping under-funded schools appeals to no one but the idea of legalizing gambling appeals to everyone. The town is so overjoyed by the prospect of transforming Springfield into a den of sin and vice that they cheer everything, from Barney belching to Burns crowing that he’ll build a casino to strengthen his stranglehold on the city’s economy. The town looks to Marge to oppose the plan in her unofficial capacity as killjoy, but she surprises everyone by embracing it. Legalizing gambling has a massive immediate impact on the town, in that it brings out the worst in everyone, with the surprising exception of Homer, who is forced to step up to the plate and at least try to be a good parent when Marge goes AWOL on her parenting duties. As he turns into Howard Hughes, Burns devolves from evil and greedy to evil, greedy, and completely insane. Saintly Marge loses her sense of self completely and gives in to a gambling addiction that keeps her at the casino for days at a time. After getting kicked out of a casino, Bart undergoes a similarly dramatic transformation into a pint-sized kiddie casino proprietor who resorts to flagrantly deceiving Robert Goulet to stay in business. Without Marge’s leadership, Lisa and the rest of the family begin to fracture psychologically, especially once Homer discovers that their home may be occupied by a bogeyman or possibly even bogeymen. “$pringfield” gleans a lot of brilliant gags out of Springfield morphing into Las Vegas (or at least Reno), though history has rendered some of them bitterly, even savagely ironic, like a sequence where the trick-performing tiger of “Gunter and Ernst” (a flamboyant magic and animal act clearly patterned on Siegfried and Roy) flashes back to its idyllic pre-captivity life in Africa and turns on its masters in a scene that eerily foreshadows Roy Horn getting mauled by one of his own tigers in 2003. It’s a brutal joke leavened somewhat by its gentle, sympathetic treatment of a tiger whose murderous rage is entirely understandable. Homer eventually succeeds in freeing Marge from the neon claws of Gamblor and receives the greatest gift of all for his sacrifice: The ability to look down on his wife for the first and perhaps last time in his life. “$pringfield” gets off to a crackling start and builds in momentum until it reaches a fine comic frenzy as it chronicles how the Simpsons and Springfield each fall dramatically apart and how they just barely manage to pull themselves together. Legalized gambling might bring out the worst in Springfield, but the deep, rich subject material of how greed can completely transform a town and its citizens brought out the best in The Simpsons. 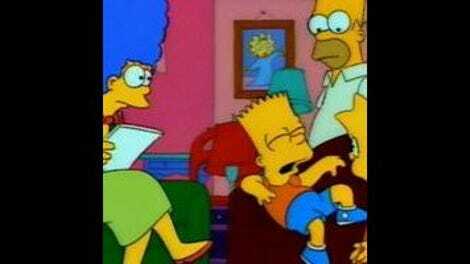 “Your little boy Bart was almost eaten by a pony!” Barney, after saving Maggie from a tiger. How perfect is Robert Goulet’s delivery here? I particularly love the incredulous way he says, “Vera said that?” after Nelson tells him his manager told him to shut the hell up.